Fine Pet Hotel for your small breed dog and cats. 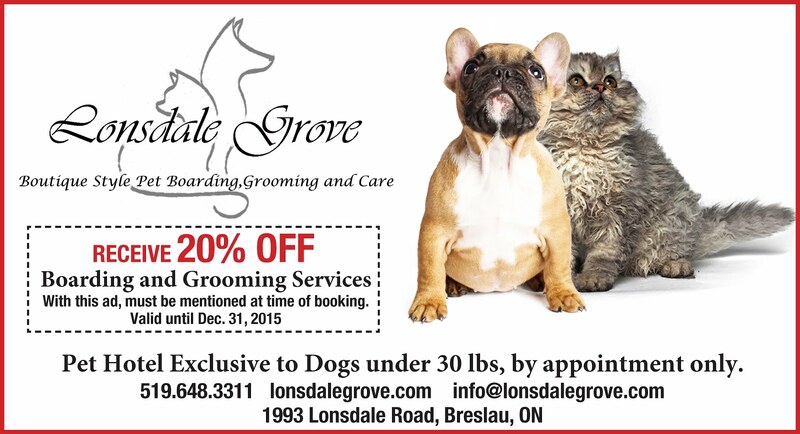 Full service Salon for dogs of all sizes and cats. In our last post we touched upon the all suite design and sealed floor drains that help ensure the health and safety of our guests. Integral to the safety discussion is our HVAC and system and the air quality at Lonsdale Grove. At Lonsdale grove, we elected to heat our suites (and cat condos) with an efficient in floor heating system. Rather than heating and drying the air and still having relatively cold floors, our heated tiled floors are warm to the touch, gentle on small paws, and comfortable to warm up on after a quick run through the winter snow. Since we heat our floors and can warm up small bodies quickly and easily, our air temperature can be kept slightly more mild, with less winter dryness than is experienced with forced air heating. 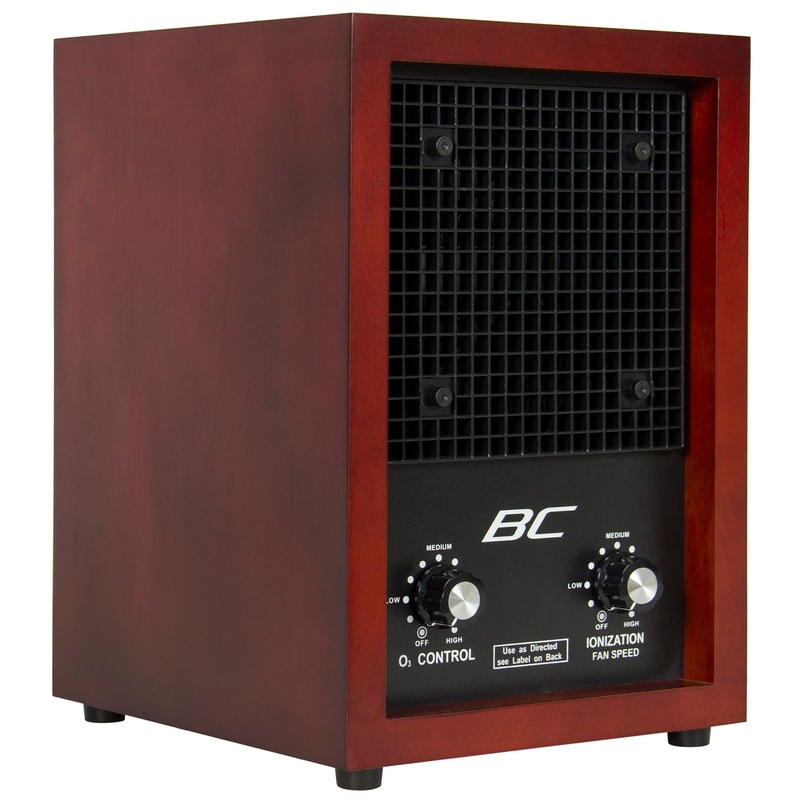 Slightly cooler, less dry air makes breathing easier and more comfortable. 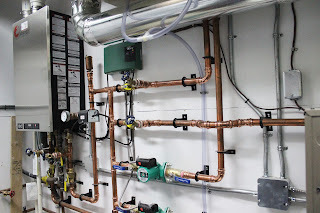 Lonsdale Grove demand boiler to in floor heat. 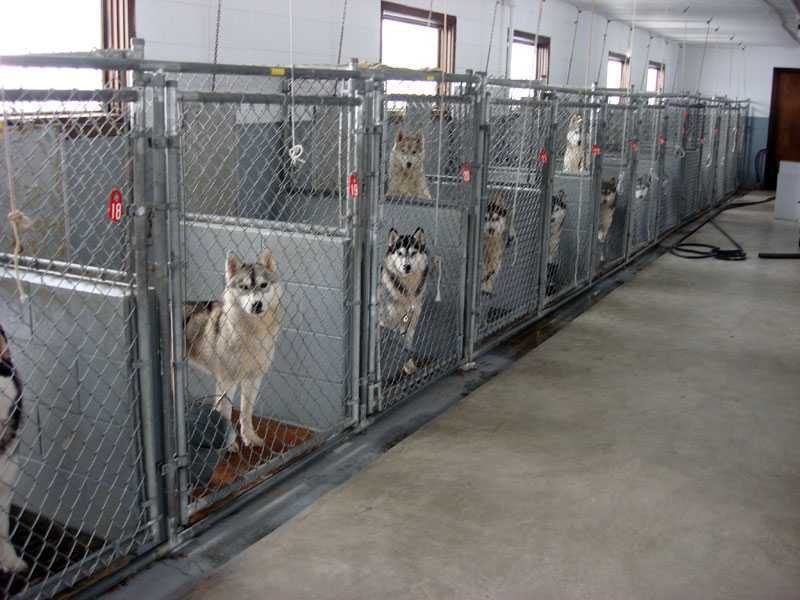 Many ‘kennel’ facilities use concrete floors to house family pets. They are a popular choice because they are durable, generally impervious to liquids, and can be easily cleaned with harsh chemicals by spraying copious amounts of water and some concentrated cleaner. They also are unpleasant to lay on, unsightly, and over time can become saturated in urine that leaves an unpleasant smell. Critical to small animals, our focus at Lonsdale Grove, these floors can be very cold in the winter. No small dog, in particular, should be permitted to lay on a cold cement floor in the winter for extended periods. Severe loss of body heat to the floor can result in a critical health situation of hypothermia and potentially even death. Small dogs are much more susceptible than larger dogs, though in our opinion cold cement floors are not suitable to house any animal. Ensure at home that your small pet always has a comfortable place to lay that is not too cold and not too hot. 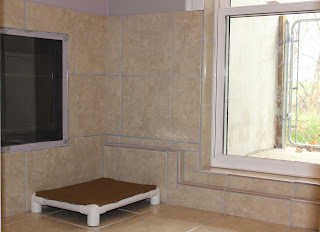 Our dog suites feature a washable raised bed with blanket. Once little bodies are warmed up, your furry family member can lounge on the more cool raised bed or lay comfortably on the tiled and warm heated floor so that they always feel “just right”. In the summer, our hotel is fully air conditioned. 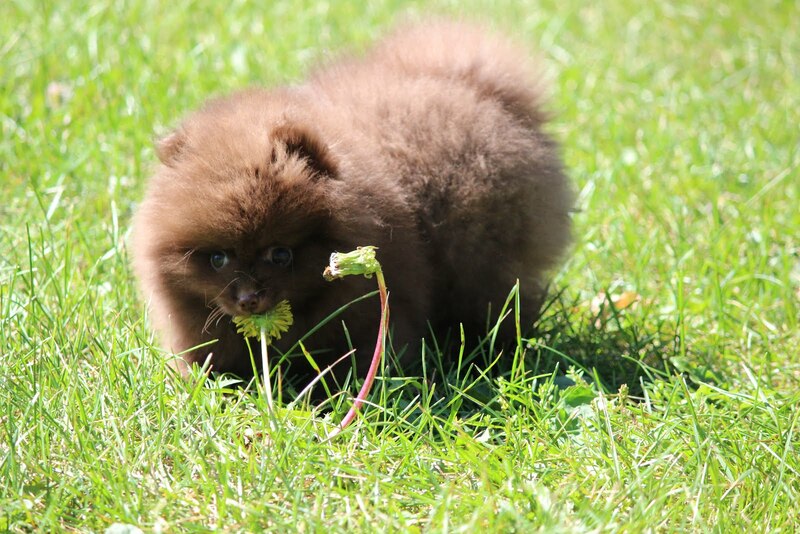 Small dogs also have more difficulty keeping their body temperature just right in the summer heat, especially those with long hair or thick double coats. But Lonsdale Grove is always comfortable. No excessive panting required. Lonsdale Grove private dog suite, raised bed and heated floors. 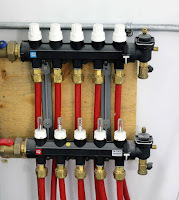 Lonsdale Grove Air cleaning distribution systems. 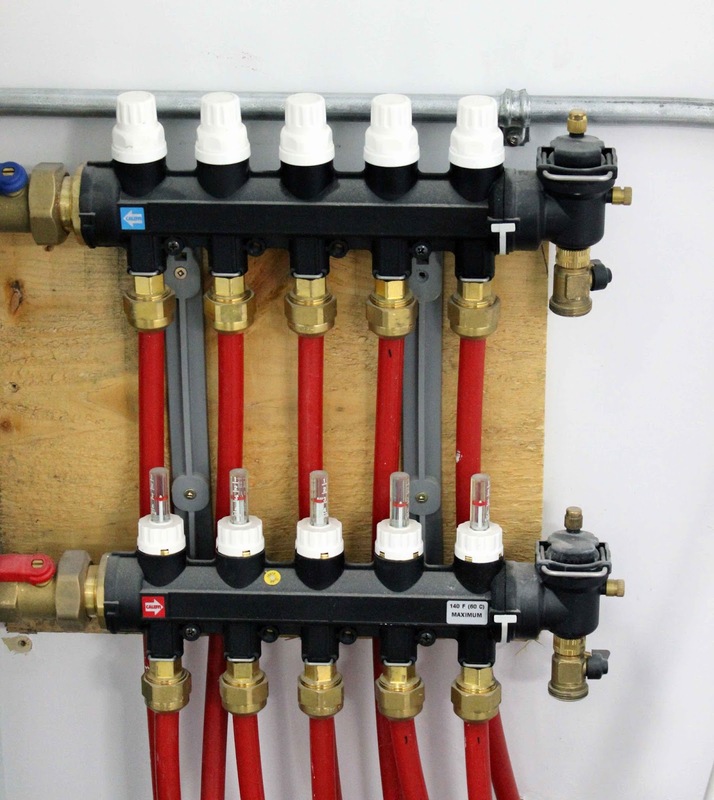 The final piece to ensuring the health and safety of our guests is our air handling system. 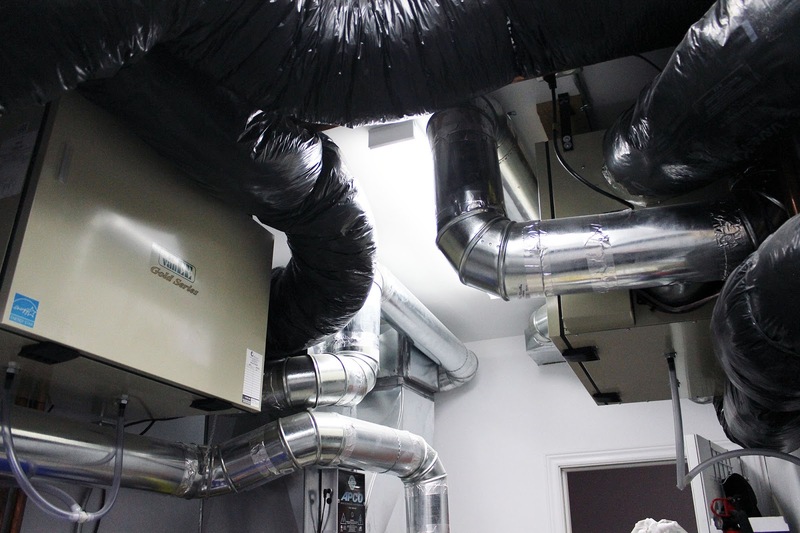 In the summer months our air handling brings cool air conditioned air into each suite and year round it is essential to bringing clean, healthy air into every suite. Each suite is equipped with its own fresh air source. Clean air flows from the HVAC system in our utility room to the suite. Air then flows from the suites back into the system via the central hallway. Air does not flow from the hallway into the suite, and this ensures that the air in each suite is fresh and clean and avoids contamination with airborne viruses. According to ASHRAE‘s (American Society of Heating, Refrigeration and Air-Conditioning Engineers) guidelines for design and construction of hospitals and human health care facilities, a minimum of 2 outdoor air changes per hour are required for intermediate care and 3 outdoor air changes per hour are needed in surgical suites. Additionally, a total of 6 air changes per hour are needed. Removes up to 80% of airborne virus-sized particles and ultra-fine particles down to 0.01 micron in size. Lonsdale Grove Ultra Violet air Purification. 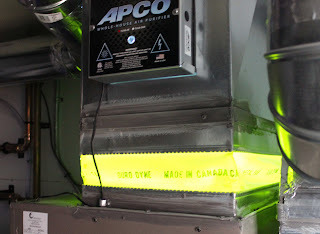 Our system then treats all of the filtered air with a UV system which further kills 99% of remaining airborne mold, bacteria, viruses and other allergens. 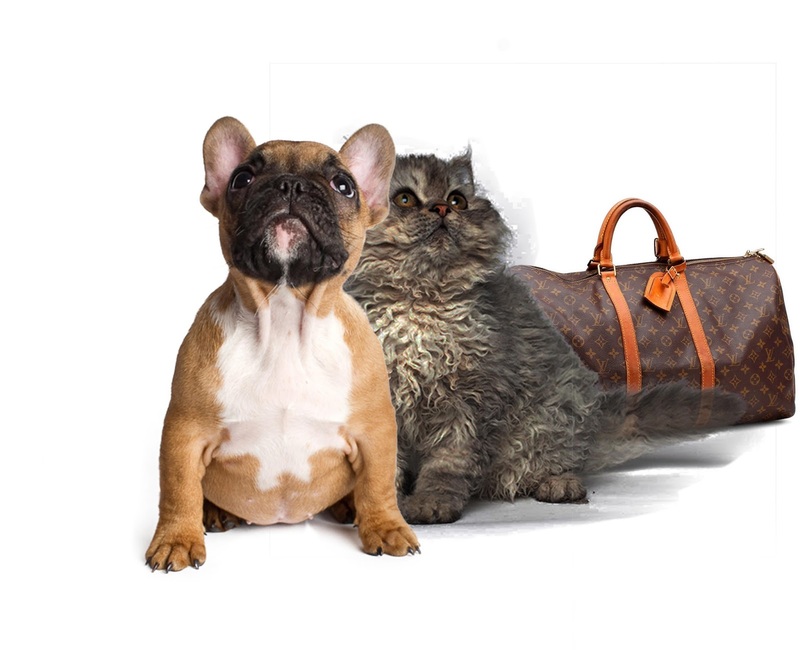 Lonsdale Grove exceeds human hospital surgical suite air quality requirements for the protection and health of your small dog and cat. We are confident that we have the best heating and air conditioning for our guests with the safest quality air possible. Air quality, viruses, mold, pollen and other allergens can be a problem at home and lead to allergies and asthma-like symptoms for both people and pets. If you don't have a high quality air exchange and cleaning system in your household HVAC system, we highly recommend adding one. Alternately, small air purifiers/cleaners that are suitable for a single room are available for around $ 150 that are better than nothing. They help to remove particles from the air and can improve air quality in the room. The best of these systems also have ozone settings. The units can generate ozone which oxidizes many airborne pollutants to destroy them and remove them from the air. CAUTION: never run the ozone setting with people or pets in the room as inhaled ozone can be harmful. Only run the ozone setting briefly—10-20 min, and allow the room to air out before re-entry. Ozone smells much like the smell produced from an electrical short or spark from a defective household outlet. Allow the smell to dissipate completely. 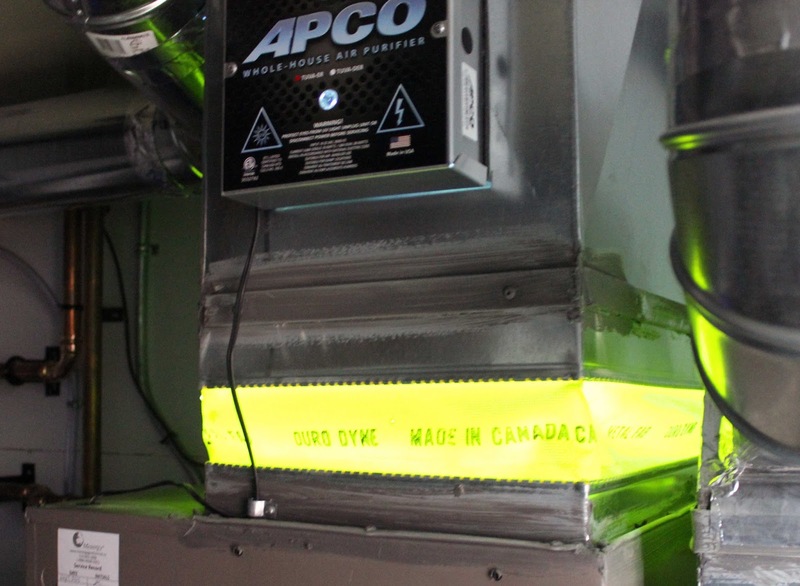 Read the manufacturer’s instructions thoroughly before using such a system to help improve your home air quality. Visit our website and Facebook page for more information and photos. Watch for our next blog post on water safety! Holiday Safety TIPS for pets. The holidays are a wonderful time of year to enjoy good food, drink and the company of friends and family. They can also be a stressful and dangerous time for our furry friends if we don't take a few safety precautions. 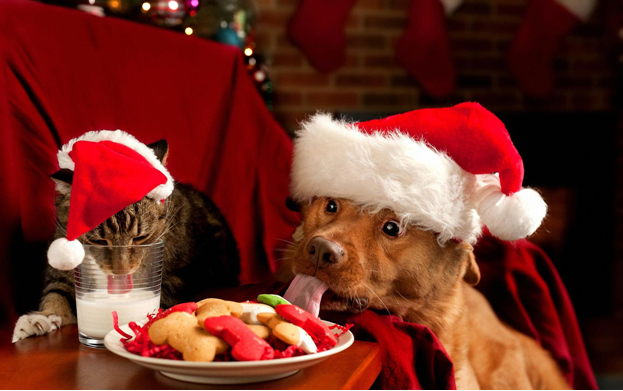 We hope you will use our suggestions below to keep your beloved pet happy, healthy and safe this holiday season. Oh Christmas tree, Oh Christmas tree, what a dangerous place to be! 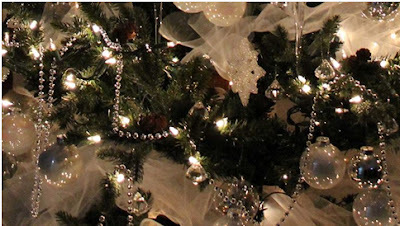 Christmas trees are a beautiful and festive symbol of the holiday season for many families. But they can also pose many dangers for our furry friends. A Christmas tree looks like a giant toy/jungle gym/snack to our four legged friends. Many a tree, real or artificial, has been knocked down by a morning stampede of dogs at play, while others have been toppled by our feline friends taking it upon themselves to check out the view and make sure there are no birds sitting in the high branches. Anchor the tree to a wall or the ceiling to prevent a toppling hazard. 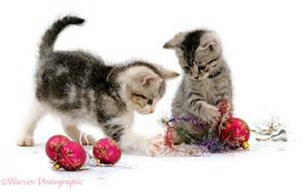 Strands of lights and tinsel look lovely, but don't make the purrfect after dinner snack for our feline friends. But cats will assuredly give them a try anyway. 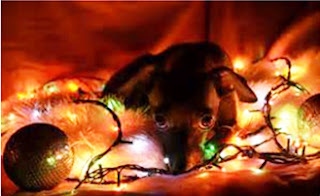 Burns and electrocution from the lights are a common holiday mishap for both our canine and feline family members. 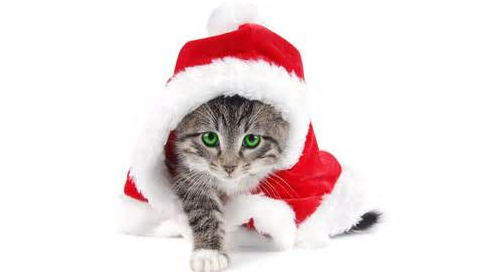 Tinsel and other stringy or sharp objects could result in bowel blockage or perforation and will require immediate veterinary care and often surgery. Glass and other sharp ornaments hold dangers too, especially when they are placed tauntingly low on branches for pets to bite or paw at. And that refreshing drink under the tree that your pet may stop for, well that’s a danger too. Stagnant tree water can contain tummy upsetting bacteria and tree sap. Preservatives or aspirin that people put into tree water to keep that tree fresh pose an even greater risk to the health of thirsty dogs and cats. We recommend keeping a Christmas tree in a room where doors can be closed to keep furry friends safe, or surrounding the tree with a small dog exercise pen available at most pet stores. 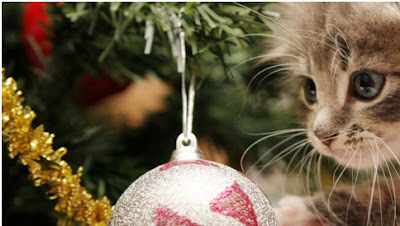 Always keep breakable glass ornaments firmly affixed to upper branches out of reach of furry paws, and keep lights turned off and cords out of reach when you are out of the room. 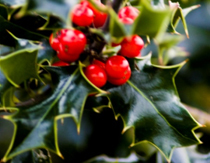 Many holiday plants are dangerous or toxic to dogs and cats. Holly, Mistletoe and Lilies top the list of dangerous toxic plants for cats and dogs that can cause gastrointestinal upset at best, and potentially worse, and require an immediate trip for medical attention. upset. Cloth and plastic decorations can be far safer, though many are toxic as well, and pose choking hazards or bowel obstruction if ingested. So place decorations high and secure to keep your pets safe. Ribbons and other decorations can be as dangerous as tinsel and cats and dogs strangely find them very tasty so watch wrapped gifts and other decorations, too. Keep in mind that holiday foods can pose a danger. It is well-known that chocolate and candies with xylitol are toxic to our pets, but many other people foods can be harmful as well. Rich, fatty foods can cause inflammation that could require a veterinary stay. Nuts can pose a choking hazard, and grapes, rasins and Macadamia nuts all contain unknown toxins that pose serious health risks to your pet. Alcohol and tobacco can be fatal. And be sure to keep poultry bones, string, foil and wraps with remnants of meat juice, and other ‘tasty’ garbage well out of reach of pets. Candles with open flames are highly dangerous, particularly when placed on dry tree branches, but also anywhere in your home that a dog or cat can reach. Animals can receive severe burns by playing with open flames, and can easily knock over a candle, quickly causing a major fire. Never leave an open flame unattended, particularly around furry friends. A much better choice is an LED candle, but pets can play with or chew these as well. And while you are thinking about fire safety, how about checking the batteries in smoke and carbon monoxide detectors, and picking up a fire extinguisher to have on hand for your Christmas baking? Monitored fire and home alarms are a great Christmas present that protects not only the home but your family too, including your furry friends who may be home alone when fire breaks out. Away in a Manger? Are you spending the holidays with family or friends? Or are you having house guests with small children or pets? Visiting with your pets in tow may seem like a great idea, but entering a home that is not pet-proof poses all sorts of dangers for your four-legged children; dangers that you won’t be aware of. And even if you think your home is pet-proof, an animal newly introduced by visiting guests may get into something that your well-behaved dog or cat would never dream of eating or playing with. So be extra cautious when your pet accompanies you or when guests pop by with their own pets. Large or noisy crowds of people can make life stressful for your pet. And the unruly nephew that seemed to have gotten a double dose of the terrible twos since he is now twice as bad at age four? Well your canine or feline friend will be none too happy when he is dragging them around by their tail or trying to ride them like a horse. Be sure to have a safe and quiet room or place where your pet can retreat to avoid the madness. Or better yet, let your pet have a safe and relaxing pampered holiday instead by booking a dog suite or cat condo at Lonsdale Grove! Even if you are staying in town this season, the holidays are a time for visiting friends, day trips and work Christmas parties. That means long days or evenings for your pets home alone. Lonsdale Grove offers day boarding for when you need to spend most of your day away from home. It is safer for everyone if you book a hotel room for after that work Christmas party so you can relax and enjoy a glass or two of cheer and not worry about driving home. Book an overnight stay for your pet at Lonsdale Grove and you will feel more relaxed to enjoy the party without having to worry about the drive home or rushing back to let the dog out. Visit our website and Facebook to see the latest photographs, or contact us to make an appointment to visit and see for yourself the Lonsdale Grove difference. Happy Holidays! In this blog post and over the next few entries, we would like to take a closer look at health and safety as well as security here at Lonsdale Grove. We will also make some suggestions along the way for helping to keep your cat or small dog safe and secure at home or when out and about. There were two major, yet very simple principles we took to heart when developing the concept of Lonsdale Grove. Number 1, to protect the health, safety and security of each of our guests, and 2, to provide an enjoyable stay where owners would feel comfortable leaving their furry family members, and those guests would be happy and relaxed with as little stress as possible. Although the family pet is always going to be most happy at home, we wanted to create an environment where they would be happy to stay. 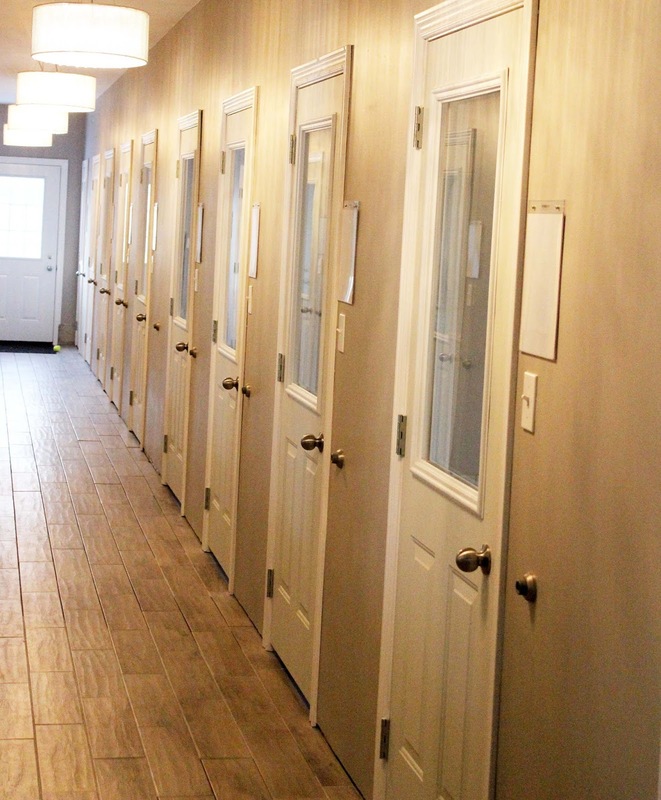 While we can cover principle number 2 in detail at a later time, we think it is pretty clear when you visit us how the design and features of our boutique pet hotel, as well as our services here at Lonsdale Grove lead to a comfortable and enjoyable stay. Visit our website and Facebook to see the latest photographs, or contact us to make an appointment to visit and see for yourself the Lonsdale Grove difference! For now, we would like to discuss the even more important aspects of health & safety, and security we provide to all guests during their stay. There are many aspects to the safe, healthy and secure environment we provide that we can’t begin to address them adequately in a single blog post. We will start here by discussing the all suite design of our hotel and how it contributes to a healthy and safe stay for your precious pet. Old style open trough drain allows for bio waste exposure. 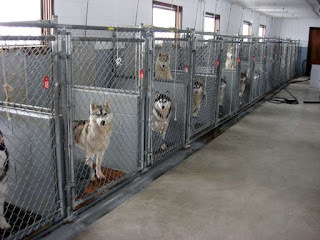 We stated emphatically from the earliest design and engineering planning stages of Lonsdale Grove that there would not be an open trough drain, so common in boarding kennels, that no pet would sleep in a cage or on a cold cement floor, and that airborne and waterborne contamination such as viruses and bacteria would not be permitted to travel easily from one animal to the next. Lonsdale Grove sealed and trapped drains. This led to an all-suite design, with proper walls that go from floor to ceiling in the indoor spaces, just like a room in your home, for all of our dog suites. Neither air nor water will travel directly between our suites from one dog to the next. Each suite has separate, enclosed floor drains so if there were any wastes or during cleaning, nothing from one suite could splash, flow, aerosolize, or track from one guest to the next. Each suite features beautiful tiled and sealed floors. 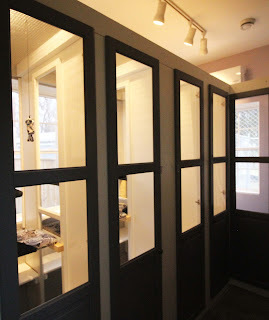 The design also has the added benefit of noise reduction for our guests. 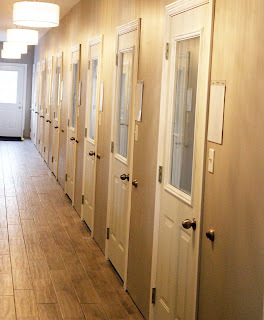 Because our guests aren’t standing starring at their neighbours through chain link, barking is kept to a minimum, and any noise in one suite is deadened by walls and insulation so as to be less disruptive to each neighbour. This results in a remarkably quieter and more relaxing stay for each guest, where they can focus on their own comfort and relaxation, rather than being stressed by noisy and disruptive neighbours. Our extensive HVAC system, the focus of our next blog post, and our sound and entertainment system that both service each suite individually, also contribute to reduced disturbance from neighbours. Lonsdale Grove dog suite private patio. 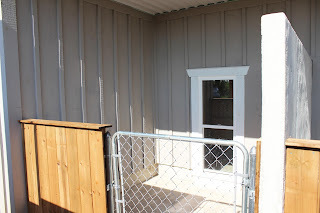 Each dog suite also features an exterior patio space for sun and leisure on fair days. The patios have walls on each side to protect from liquid and air contamination from neighbours, a roof to protect from the elements, and an open front end and gate to allow ample flow of fresh air and sunlight. 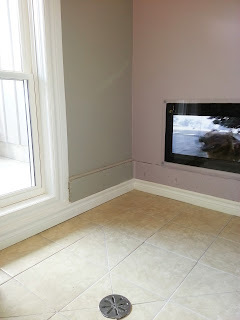 Each exterior patio also features an individual sealed drain with no cross-contamination from the neighbouring suites. The floors slope to drain any liquids into the individual drain rather than through a community trough as is so common with ‘kennel’ buildings. cat room, well removed from our dog space. The cat room also features tiled floors, no open drains, solid walls and individual suites. Cats can see the other guests of the room through solid glass windows in each condo, which also serves to allow ample light in. Plenty of fresh, climate controlled air flows into the cat condos, and the entertainment system pipes in soft music or the sound track to the TV entertainment. 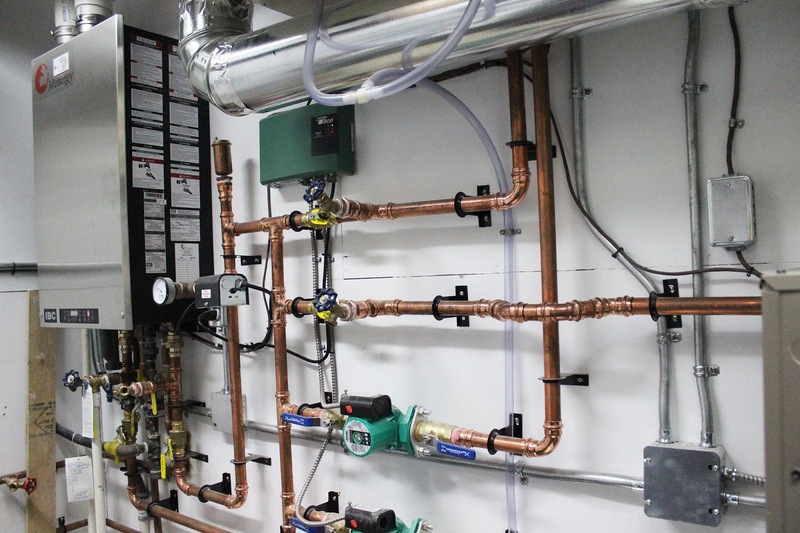 During our next blog post we will discuss the HVAC and air exchange system that is at the heart of our health and safety efforts at Lonsdale Grove. 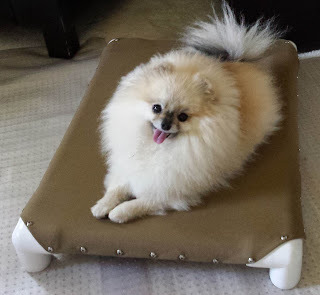 If you are looking for quality small dog daycare in the Kitchener Waterloo area, please call our friends at The Lavish Lair Small Breed Doggy Daycare. You won't be disappointed. Introductory Promotion. Don't miss out! Boarding for small breed dogs and cats. Grooming for all!